Figure 1. 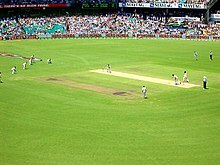 Sydney cricket ground. 18:00, 31 August, 2018: Made a social contribution on the canvas discussion forum. I provided advice for other students to help them edit the source code to create a hanging indent in their reference list, in order to comply to APA conventions. 14:36, 1 October, 2018: Made a social contribution on the canvas discussion forum. I responded to another students post providing them with a link to my wiki book chapter. I also asked for the link to their book chapter and offered to provide feedback. 15:50, 1 October, 2018: Provided feedback on the book chapter childhood neglect and emotion and suggested a useful link that may be of help to the author. 18:31, 1 October, 2018: Provided feedback on the book chapter abortion and emotion and provided links to useful journal articles. 18:51, 1 October, 2018: Edited reference list on book chapter compliments, emotion, and motivation, to ensure compliance to APA conventions. 17:05, 1 October, 2018: Edited reference list on book chapter compliments, emotion, and motivation to include doi's and ensure compliance to APA conventions. 19:12, 1 October, 2018: Provided feedback on chapter compliments, emotion, and motivation and provided a link to an APA referencing guide. 11:27, 13 October, 2018: Edited page compliments, emotion, and motivation to correct grammar. 11.27, 13 October, 2018: Edited page compliments, emotions, and motivations to correct grammar. 11:35, 13 October, 2018: Edited page compliments, emotions, and motivations to correct grammar. 11:43, 13 October, 2018: Edited page compliments, emotions, and motivations to correct spelling and grammar. 11:47, 13 October, 2018: Provided feedback on chapter compliments, emotions, and motivations. 12:38, 13 October, 2018: Provided feedback on chapter self regulated learning and provided a link to the UC APA 6th edition referencing guidelines in order to ensure compliance to APA conventions. 12:51, 13 October, 2018: Provided feedback on chapter impulse buying motivation and provided a link to an external wikipage that may have been helpful to the author. 17:20, 16 October, 2018: Provided feedback on chapter Emotional intelligence and leadership effectiveness and suggested adding some focus questions and a quiz to break up the text and engaged the reader. 17:24, 16 October, 2018: Responded to another student on the canvas discussion forum. 17:40, 16 October, 2018: Provided feedback on chapter Vicarious post-traumatic growth and edited the reference list to ensure compliance to APA conventions. 17:44, 16 October, 2018: Provided feedback on chapter vicarious post-traumatic growth. 19:25, 21 October, 2018: Provided feedback on chapter restorative justice and emotion. 19:29, 21 October, 2018: Respond to another student on the canvas discussion forum.